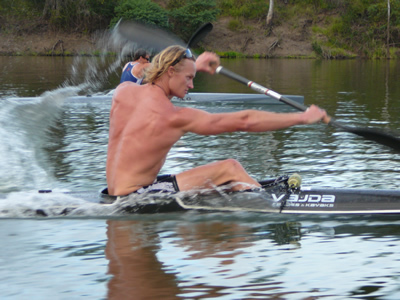 One way I explain the influence of our hidden modules to my athletes is to tell them about a kayak race I had against Steve Ferguson.Steve is a champion kayaker and so when I challenged him to a race over 100m he was supremely confident he'd beat me by a huge margin. As we lined up in our lanes it looked like a complete mismatch. Steve was all bulging muscles and a big smile while I was having trouble just keeping my racing kayak balanced. But when the gun sounded everything changed and the smile was wiped off his face. You see, unbeknown to Steve, I'd modified the rudder underneath his kayak so it was jammed permanently to the right. As soon as Steve took a couple of powerful strokes his kayak began to swerve violently in the wrong direction. There was much yelling and splashing of his paddles as he struggled vainly to control his kayak and get it pointed in the right direction. Meanwhile, I just glided on smoothly towards the finish line using only modest strokes. The point of this story is that we can think of our 'paddles' as our 'conscious logical thoughts'. They're above the water, they're visible and we put a huge amount of effort into them. While all this conscious effort is going on, our unconscious emotions are operating below the surface like a hidden rudder - exerting a huge influence on our behavior without us even realizing it. If our mental 'paddles' and our mental 'rudders' aren't aligned in the same direction then no amount of effort and 'splashing' is going to allow us to achieve our Goals. No amount of 'trying harder' and resolving once again to change our direction is going to work.